Happy Tuesday everyone! Did you know that today is World Malbec Day? Celebrated on April 17th each year to commemorate the day in 1853 when Domingo Faustino Sarmiento, then the president of Argentina, began the process of incorporating new grape varieties into the country's agricultural program. Soon after, Malbec vines were brought over from Southwest France and the transformation of Argentina's wine industry began. Malbec is now considered the flagship wine of Argentina. Malbec was never my “go-to” red wine. Over the years, I’ve tried many that were unbalanced, "in your face" wines — overly fruity, ripe, and concentrated. But more recently, I've discovered some beautiful Malbecs that, while still being intense wines, have balance and complexity and can be enjoyed all year long. In the summertime, they pair beautifully with every type of barbecued meat and even grilled fish, especially the heartier kind like salmon, tuna and swordfish. During the cooler months, Malbecs go perfectly with stews, whether they're made with beef, chicken, lamb or pork. 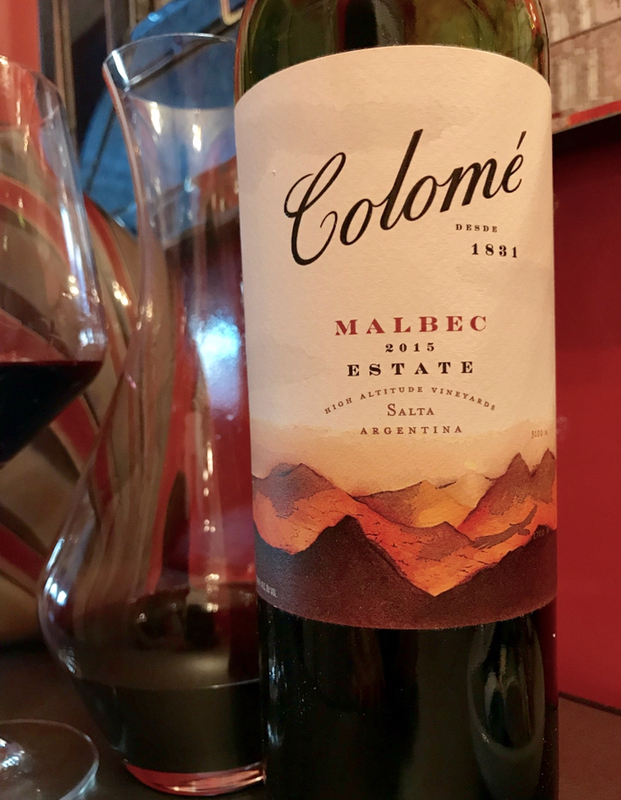 Last week I was sent a delicious Malbec from Bodega Colomé, a winery based in the Calchaqui Valley in the Salta region of northwestern Argentina. Colomé's vineyards, some of the highest in the world, were planted in the 1800s on original rootstock imported from Bordeaux. In 2001, Colomé became a part of the Hess Family Wine Estates based in Napa, California. Donald Hess has been instrumental in revitalizing the Salta region with a strong commitment to the community. By creating programs to help the local population and developing sustainable vineyards, he has brought new energy to the region. 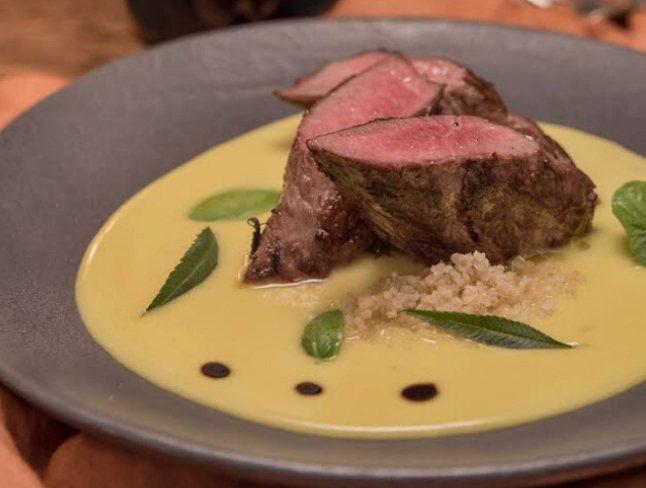 Adapted from a recipe by Bodega Colomé, this recipe is equally delicious with beef, pork or chicken substituted for the lamb. 2) Boil water for corn. Add ears of corn to the boiling water. Cook for 7 minutes. Remove corn immediately and place in ice water. Shell the ears of corn. Alternatively, use canned or frozen corn. If using canned, place corn in strainer and rinse in cold running water before using. For frozen, follow package directions. 3) Sauté the onion and garlic in a medium hot pan with a tablespoon of butter for 5 minutes, until softened. Season with salt and pepper. Add corn and cook for 3 minutes. 4) Add onion, garlic and corn mixture to blender with 7 oz of water, and liquify until smooth. Strain the soup through a fine-mesh sieve, pushing down on the solids. Add sherry vinegar, stir and set aside. 5) In a saucepan, boil the water, add 1 tablespoon butter and salt and then add quinoa. Cook until the quinoa is transparent, about 15 minutes. Stir and set aside. 6) Add olive oil to medium-sized saucepan over medium low heat and sauté onions and carrots. Add the cumin seed and paprika and cook for 3 minutes, being careful the spices don't burn. Raise the heat and add the red wine, stirring and scraping the bottom of the pan. Allow the alcohol to evaporate (about 4-5 minutes) and add the broth. Cook until liquid is reduced by half, about 10 minutes. Strain the sauce and heat again. Add butter, honey and salt. 7) While sauce is cooking, Season the lamb chops with salt and pepper. Add oil to pan and heat to medium-high, add garlic, cut side down. Add the meat and sauté each side about 2 minutes. Place pan in oven. After 8 minutes, check for doneness to make sure they are medium-rare to medium. You can use an instant meat thermometer to check – it should register 145 F. If not, place meat back in oven an additional 5 minutes and check again. 7) To serve, ladle corn soup into bowl and add a spoonful of quinoa in the middle of soup. Place 2 lamb chops on top of the quinoa. Spoon 2 - 3 tablespoons of red wine sauce on top of the meat. Sprinkle dish with basil, mint and parsley. Serve with roasted broccolini on the side. Bodega Colomé Estate Malbec 2015 ($23) - Predominantly Malbec with small amounts of Tannat, Cabernet Sauvignon, Petit Verdot and Syrah. This stunning wine combines power and elegance. Rich, but not too heavy, this wine is Argentina in a glass! Click here to find out where to purchase it. Domaine Bousquet 2015 Grand Reserve Malbec ($20) - Made from organic grapes grown in Tupungato, at an altitude of 1200 meters (4000 feet) above sea level, one of the highest points in Mendoza. This well-balanced, mouth-watering wine is composed by 85% Malbec, 5% Cabernet Sauvignon, 5% Merlot, and 5% Syrah. Find it here. Huarpe Agrelo Terroir Malbec Blend 2011 ($14.99) - The blend of 80% Malbec and 20% Cabernet Sauvignon has notes of black and red cherries and black pepper. Click here to purchase it at Grape Collective. Zorzal "Terroir Unico" Malbec 2015 ($10.99) - From the Uco Valley of Mendoza (a source of some of Argentina’s finest wines), this full bodied, complex wine has great balance and is a steal at this price. Click here to purchase it at Grape Collective. Tikal Amorio 2013 ($29.99) - Produced by Ernesto Catena, this Malbec blend (60% Malbec, 40% Cabernet Franc) comes from organically farmed grapes in the Uco Valley of Mendoza, Argentina. Click here to find it in your local wine shop. Pascual Toso Alta Malbec 2013 ($36.99) - Made from grapes grown on sixty year-old vines, this 100% Malbec is smokey, fruity and spicy and would pair wonderfully with lamb or beef. Click here to find out where to purchase it.